I’m no longer a farmer’s wife; I’m a farmer. Don’t worry, still married to the original farmer, but I’ve earned my stripes. There’s something safe about being the wife of the farmer and not the actual farmer, there’s less responsibility for one. Well, you still have to carry the burden of decisions made, inclement weather and cash flow no-nos but the buck doesn’t stop with you, ultimately. It would be a mistake to think that farming stops at the farm-gate, in the calving unit or in the field. And if I’m honest, I had left the farm, for the most part, to the original farmer. My job heretofore involved rearing the kids and keeping the farmhouse going was more than enough. But then the opportunity arose to become more involved and I took it on most unenthusiastically. Didn’t I know all about farming? Wasn’t I now married to him ten years! I had lived through a couple of bad years and some good. Nodding along when he talked about where he was going to move the cows to like the partner of an over enthusiastic chess player, unknowingly clueless. 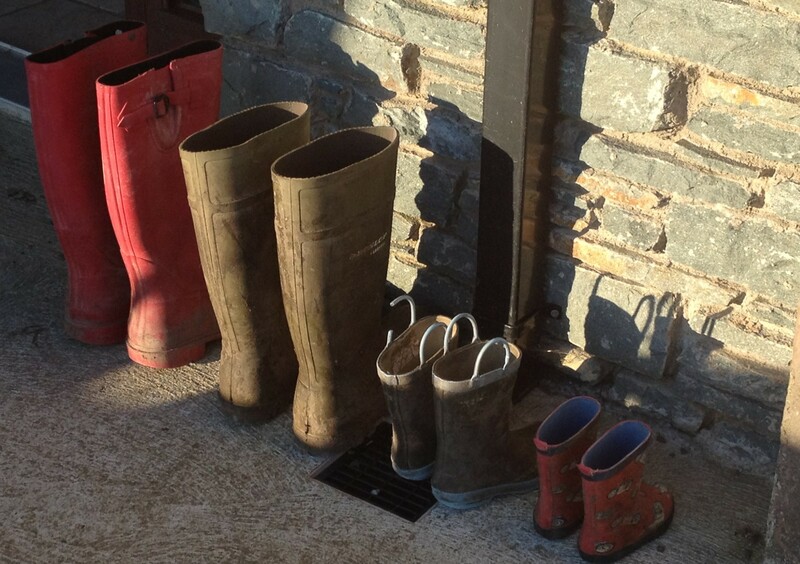 And while I’m not in wellies full time, I’m more involved in the running of the farm. I understand what’s going on and know the support that I can lend him daily to get the work done. Success in farming comes with good management and animal husbandry. It starts like all businesses in January, back at the drawing board. And this new agricultural dimension for me has helped me invest more in our life as farmers. So as we sit in our boardroom (really untidy office) planning our goals for the year, our moves and shakes, I’m the apprentice full of ideas, met with the pragmatism and experience of the boss. A good team. It took me a while to take the step, to overcome obstacles I put in the way of my becoming a farmer (and much more besides) but now I’m the actually girl of the house in wellies, there’s no looking back. Here’s to 2017. This entry was posted in Uncategorized on January 4, 2017 by annebennettbrosnan.